Cooperate with companies and institutions on projects in the area of social services and environmental development to ascertain the link between the university and society and this serves the Pharos University vision. Supervise practical field research that serves society. 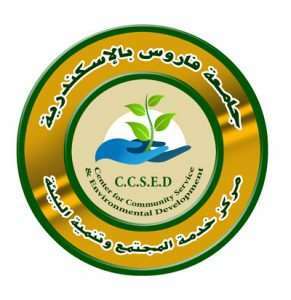 Launch a variety of activities in the area of social services and environmental development. Develop training programs to meet the needs of the Industrial sector. Provide technical assistance and consultations to establishments and individuals. Implement the plans and policies set by the University Committee for Social Services and Environmental Development. Establish the duties and responsibilities protocol for all personnel in the center and provide job descriptions for the employees. Set the regulations for salaries and stipends for individuals working in the center. Review the submitted financial and progress reports. Establish the annual financial plan and the final expenditure to be reviewed by the Board of Trustees and the University Council for approval. Set the financial regulations for researchers and academics from the university and other institutions. Institute the regulations for the Center contracts with other individuals or institutions. Review all that the Executive Board Director*deems are his responsibility. Calls for and heads the committee meetings. Follows the rules and regulations set by the University Board for Social Services and Environmental Development and ensures their objectives are met. Contacts internal and external bodies for all issues related to the Center. Sanctions contracts for all Center collaborations after the approval of the Executive Committee. Approves the payment of salaries and remuneration for staff members, assistants, and consultants resorted to for work in the Center. Make choices of all local experts and part time employees based on the suggestions provided by the Center Director* and reviewed by the Executive Committee. Supervise the technical, administrative and financial running of the Center. Supervise the financial plans and final reports that include the Center financial standing before submission to specialized committees. Suggests payments and remuneration for the Center employees. Prepare regular reports about the Center activities. Provide suggestions to enhance the Center in its specialized areas. Follow up on the implementation of the Executive Committee instructions to ensure competent performance. Suggests resorting to part time employees and offer contracts to be reviewed by the Center Director. Endorse all contracts that concern the Center with others. Suggest the participation in internal and external conferences after obtaining the necessary approvals. The Executive Board meets at least once every two months, or whenever necessary, based on an invitation from the Executive Director*. The meeting must be attended by most of the members and recommendations and decisions must be passed by a majority vote. The meeting minutes are signed by the Center Director and the Executive Director. The University President is formally notified about the Committee decisions within a period of eight days. The decisions are considered approved if no objection is received within a period of two weeks from the date of notification.